B9Creations earns top ranking award in 3D Hubs 2016 3D Printer Guide among global competition. RAPID CITY, S.D. Nov. 24 2015- Local 3D printing company, B9Creations earned top ranking on 3D Hubs, 2015 3D Printer Guide. B9Creations is a global 3D printing company that was locally founded in December 2011. B9Creations is known globally for its high speed, high resolution, and high quality products that are unmatched at their price. Since the start of the company B9Creations has earned multiple awards for the performance of their 3D Printer, B9Creator. This award/ranking is another one for the books. 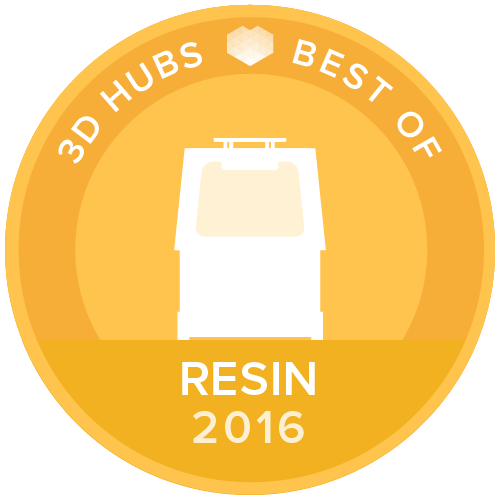 3D Hubs, the world’s largest and fastest growing networks of 3D printers, has given the B9Creator a 3D Hubs Best of Resin 2016 award. These awards are based off of community members’ reviews from 5,350 verified 3D printer owners. Awards are given out in five different categories, Enthusiast, Plug ‘N’ Play, KIT/DIY, Budget, and Resin. “B9Creations is honored to receive this ranking, on a well-known 3D printing site. It is confirmation that we are on the right track in the 3D printing world,” Shon Anderson, VP of sales and marketing. Take a look at the award for yourself http://3dhubs.com/best-3d-printer-guide and congratulate the B9Creations team on Facebook for this remarkable accomplishment. For further inquiries please contact Shon Anderson, VP of sales and marketing, at shon.anderson@b9c.com or via phone (605) 787-0652.